Plus, if you like these, do not leave before checking out the Unicorn Poop Cupcake version. 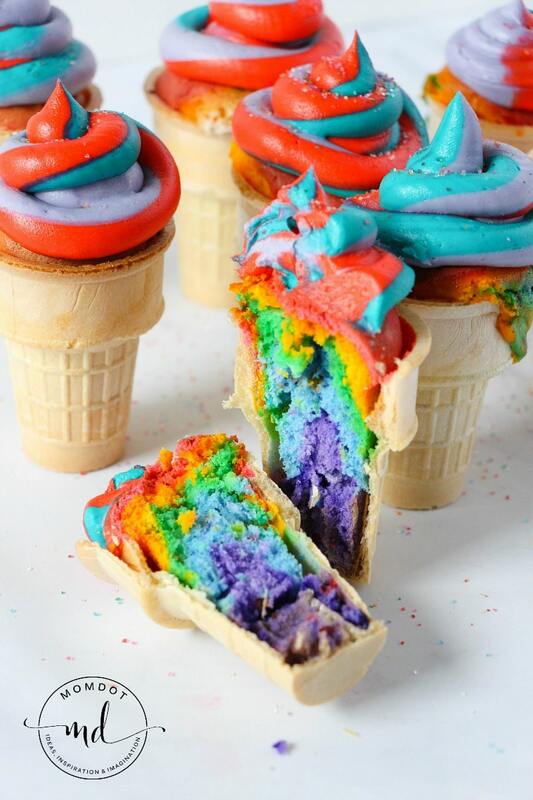 If you are going to get started on these Rainbow Cupcake Cones, the frosting is EVERYTHING. Make sure you pick up this tri-color bag set and coupler, which makes making these swirls super easy. It’s really inexpensive on Amazon and will make your entire process much more smooth! DO NOT START THIS PROJECT WITHOUT THIS! In a hurry to get started? 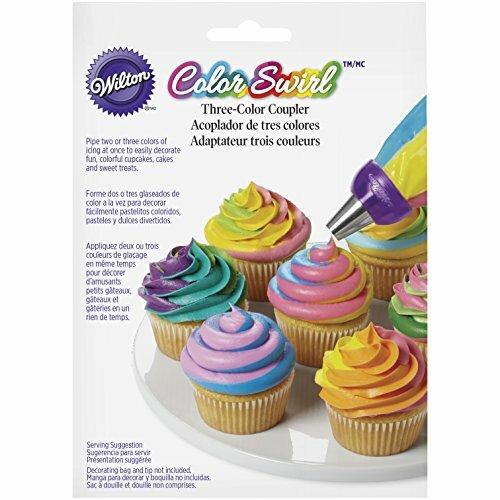 Go HERE to get your Color Swirl Cupcake Frosting Tip Now! Now separate your cake batter into 6 bowls for the 6 colors of the rainbow and add gel dye to achieve your desired colors. Add a scant 1 Tablespoon of each color to the cupcakes, starting with purple, then blue, green, yellow, orange and topping it all off with red. Add the butter and icing sugar to your mixer and beat on medium speed for 1 minute. Add the vanilla and 1 Tablespoon of cream. Beat for at least one minute before adding additional sugar or cream to achieve your desired consistency. Separate your frosting into 3 separate bowls and add 3 of the rainbow colors – I went with red, teal and purple. 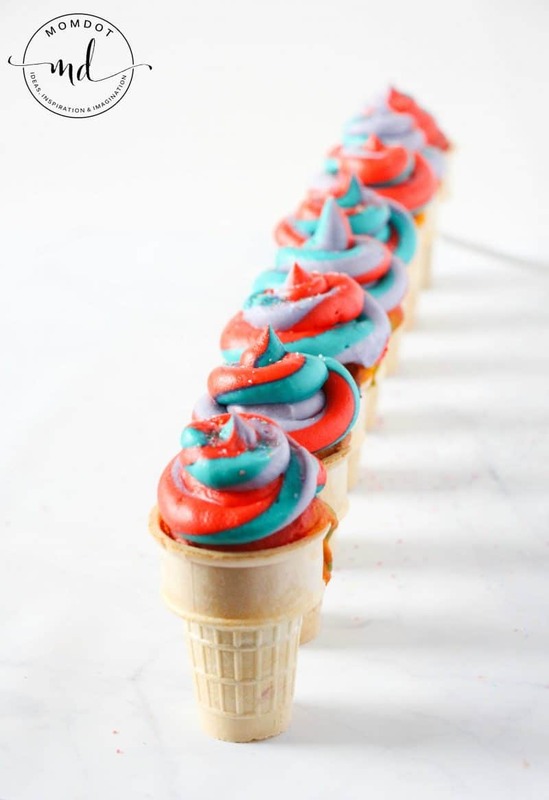 Fill your 3 piping bags with one of each color and cut off tip of each one. Put 3 bags of colored frosting inside the coupler bag with the coupler so that the tip of each bag is in the circle tip, creating one frosting bag. PRO TIP: This is the BEST coloring system out there for projects like this! 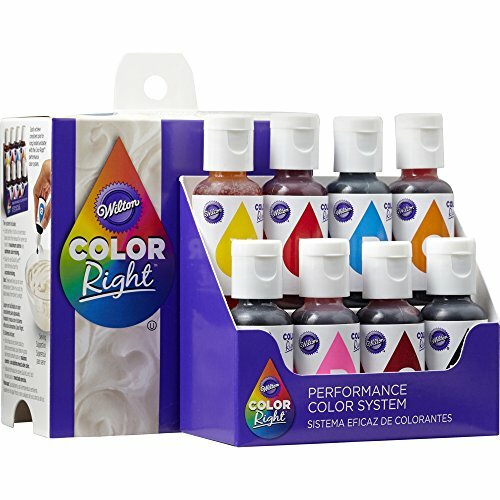 The Wilton Color Right Performance System wont thin your icing or your cake and can also be used in craft projects like slime. I keep this on hand ALWAYS. You can pick some up on Amazon and get the kit. Its also great for the Unicorn Poop Cupcakes and lasts a long time. For the brightest and best results, this is my favorite dye.